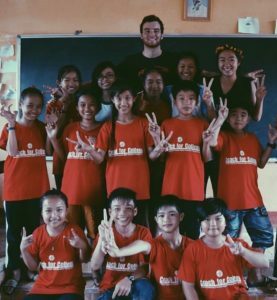 During the summer of 2016, seven Princeton student-athletes were selected to travel to the Hau Giang Province in southern Vietnam to volunteer for Coach for College, a global initiative aimed at promoting higher education through sports. These student-athletes taught academics, sports and life skills over the course of three weeks to disadvantaged youth at various Secondary Schools. The Princeton Varsity Club provided funding for the majority of the necessary expenses associated with the charitable service trip, with the remainder of the funds being raised by the individual participants. The PVC sat down with each student-athlete to learn more about their educational experience this summer. Our fifth conversation is with Tyler Sullivan ’18, a member of the Princeton men’s swimming & diving team who traveled to the Hau Giang Province – Hoà An of Vietnam. What were your expectations for the trip after you learned you had been selected to represent Princeton University? I was honored and excited to represent Princeton – but with this summer being my first large trip out of the country, I found myself unsure of what to expect. I tried to focus my expectations on what I hoped would become great relationships – with both the kids I would be teaching and with the college students I would be working alongside. Looking back after the trip, I am very grateful to have developed these relationships – relationships that I will treasure far into the future. What were the most striking differences between your experiences in the United States and that of life in the area of Vietnam that you visited? While we encountered differences at every stage of the day, traveling around the rural township while on early morning runs really shed light on many aspects of the local life and culture. Well before dawn, entire families could be seen leaving their homes to head to the local farms and market to begin their day. Over the town, a loudspeaker would blare local and national news, providing a unique sense of community unity as farmers and merchants set up shop for the day. The occasional moped would fly by, disrupting the quiet peace of foot traffic and children on bicycles. On these early mornings, I felt a special sense of connection to the region we were calling home. How did the language barrier affect your teaching/coaching strategies? As I began teaching, I found that the constant interaction with the language barrier not only improved my relationship with the Vietnamese students acting as translators, it also greatly improved my teaching itself. Both forcing me to think deeply about the words and sentences I was using and also encouraging better use of body language, movement, and posture, the language barrier pushed me to become a better and better teacher as the summer progressed. Can you tell us a little about the children you taught as part of the program? The kids were amazing – incredibly enthusiastic, funny and highly driven. Seeing their faces light up as we began each new class, I learned so much about approaching every day in a positive and respectful way. I will take their enthusiasm for the “little things” in life and do my best to apply it to life at Princeton and beyond. Can you tell us what a typical day was like? The day started before daybreak, typically with a morning run around the roads and trails of the town. When the sun started coming up and the roosters started crowing, we would begin to head back for a quick shower and breakfast before heading to school. The showers were taken out of a bucket, and the breakfast was prepared by the incredible family with whom we were staying. Upon starting school, we would begin work with the kids, as they went through a variety of subjects, lessons, and sports. My best memories came from these long days with the kids. After a lunch and an afternoon session, our day came to a close after almost 10 hours at the school. After a wonderful dinner (I finally learned how to correctly eat with chopsticks!) we would hold a nightly meeting, recapping our thoughts and experiences from the day while planning and sharing ideas for the next. What is your favorite memory of the trip? My most memorable experience came on one of the last days of the camp, when some of the kids came up to a few of us with a small soccer ball – asking us to play with them. However, when we arrived at the backyard field situated behind the school, we found it to be more mud than a field. As we stood and stared, the kids grabbed the ball and ran wildly into the mud, giggling and laughing the whole way – ready to play. It took a minute, but pretty soon we were the ones giggling and laughing as we slid around the mudfield, scrambling and diving after a mud-covered ball. On that afternoon in the mudfield, I know I created one of my most truly fond memories. We played and played and played until we were completely exhausted from running and laughing, layered in mud, and starving for dinner. We slowly made our way off the field, and the kids gave us all rides home on their two-seater bikes, teetering and wobbling all the way home. While going after a ball during the same soccer game, I wiped out spectacularly, as if someone had picked me up and spun me through the air. As if I were Charlie Brown kicking a football. As I landed with a thud and indicated I was okay, everyone burst into laughter. While it may have been more funny for everyone else than it was for me, funny accidents like this one became very central in bringing us closer to the kids, and gave everybody a good laugh. How have you changed as a result of participating in Coach for College? I felt really immense personal growth from my time in Southeast Asia. Life in the Mekong Delta gave me a sense of calm and happiness that can be often hard to find at home. I hope that I have taken some of the Vietnamese hospitality and willingness to help home with me. I know that my experience showed me that while living in my everyday stress, I am skipping over truly valuable things. What would your advice be to current Princeton undergraduates about participating in this program? Take the plunge. I watched as my initial uncertainty about the experience transformed into a great love and appreciation for a place and culture literally half a world away from my own. With the overwhelming warmth and hospitality shown to me by everyone I met, you can’t go wrong. Coach for College showed me how big the world is, but also left me with relationships and memories that I will always treasure and always remember. To see more photos from our student-athletes’ experiences in Vietnam, click here.